I always tell people that I wouldn’t be vegan if I felt like I was missing out. And for me, if there wasn’t a delectable vegan macaroni and cheese recipe, I would be missing out! So thank you to Ann Gentry, author of The Real Food Daily Cookbook: Really Fresh, Really Good, Really Vegetarian, for providing such a great mac and cheese option! This vegan macaroni and cheese is creamy, rich, and a true comfort food. Also, for those of you who don’t know, Real Food Daily is a vegan restaurant serving up truly tasty vegan juices, smoothies, burgers, burritos, salads, desserts, and more in the Los Angeles area. It’s one of my “go to” places when I visit Los Angeles. Really. I often find myself planning my activities in Los Angeles so that I will end up near one of their locations around lunch or dinner! Real Food Daily has 4 locations: Santa Monica, West Hollywood, Pasadena, and the LAX airport! For more information, check out their website! First, gather your creamy cashew cheese ingredients. Most of the ingredients are pretty typical with the possible exception of the Agar agar. Agar agar is a sea vegetable that is packed with fiber that is dairy-free and gluten-free. Agar agar can be used as a gelling agent which makes it the perfect vegan substitute for gelatin in cooking or baking! For more information on agar agar, click here! I purchased my Agar agar from my local co-op. It can be found at health food stores or of course online: Eden Foods Agar Agar Sea Vegetable Flakes — 1 oz. First, add the cashews to your food processor…. And pulse until they are ground. Make sure you don’t let the food processor go for too long or you will end up with cashew butter! It’s then time to add the nutritional yeast, onion powder, and garlic powder. And pulse again until combined. You can then set the dry mixture aside. Mix the non-dairy milk (I used almond), canola oil, and agar agar in a saucepan. Stir the mixture until the agar agar dissolves. Then slowly add the saucepan mixture to the dry ingredients in the food processor. Finally, add the miso, and you will have some delicious tasting cashew cheese! I put my cheese mixture in a bowl and set it aside. Then boil the pasta (I used brown rice pasta) until it is tender but not overly soft — remember that you will be baking the mac and cheese in the oven later. Once the pasta is done you can let it sit in the strainer. Then, mix the cheese and pasta together. I have to admit, at this point, I took a couple of bites of macaroni and cheese. But be patient, because the next steps take this dish to another level! 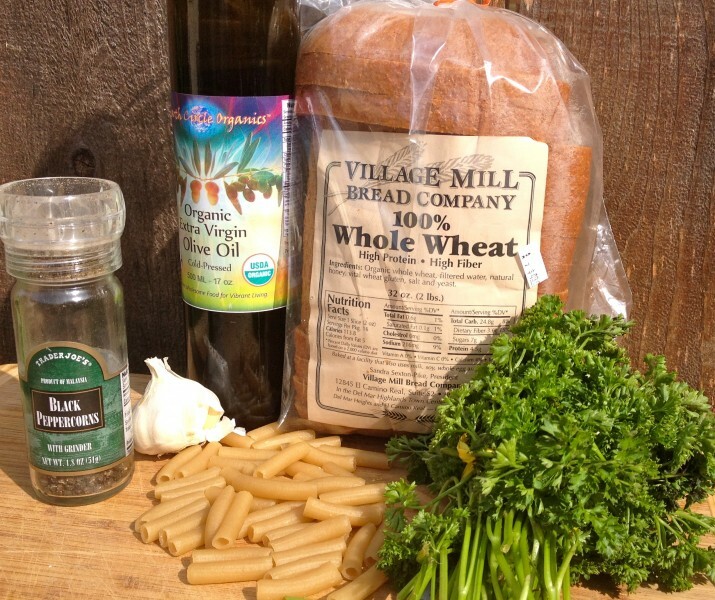 First, place the bread, parsley, olive oil, garlic, and pepper in the food processor and mix until combined. Lay the macaroni and cheese in the bottom of the casserole pan, and sprinkle the bread crumb mixture on top. Bake the macaroni and cheese, and you’re done! Time to dig in. I warn you, it’s difficult to stop eating this pasta once you get started! Add the pasta and cook for approximately 8 minutes or until tender. The pasta should still be firm. Add the parsley, olive oil, garlic, and pepper to the food processor and pulse util combined. Do NOT overmix. Sprinkle bread crumb mixture on top of macaroni and cheese and cover with tinfoil. Bake for 20 minutes. Then uncover and allow to bake again until topping is golden brown (about 15 minutes).